Well, today's the day! After two years of planning and saving, we are on our way to Italy this morning! I will be going there with my daughter, Brianna, and my son, Anthony. Excitement doesn't even begin to describe how I feel about this trip. We will be staying overnight in 8 cities and also have day trips planned along the way. Let's not forget time at the beach - actually being able to swim in the Adriatic and Tyrrhenian Seas. How cool is that? I will share details of the trip and any responses I receive from the abandoned art project upon my return. Until later..."Arrivederce". I will be leaving for Italy for vacation in a couple of days and wanted to make sure I had completed some art projects I committed to before taking my trip. ...And We Have a Winner!!! Thank you to everyone who entered my milestone blog giveaway. The winner was selected by a random number generator. Congratulations to Claudia Sullins!!!! Claudia - I will be mailing your package to you this week. Enjoy!!! A Milestone Giveaway Celebrating 68,950 Blog Views & 450+ Followers! The giveaway consists of an assortment of jewelry designs I have made over the years, including: four altered domino pendants and pins; two resin bottle cap pendants; a pair of polymer clay York Peppermint Pattie earrings; a polymer clay Good & Plenty key chain; a soldered glass pendant/brooch (it can be worn either way); a polymer clay Marilyn Monroe brooch; a pair of Marilyn Monroe pink pop art style earrings; an M&M resin candy ring and matching pendant; a pair of resin Conversation Heart hair pins; a resin Monopoly board game necklace (complete with embedded mini dice); a "Love Is" heart pendant; a polymer clay retro pin-up girl necklace; a sparkly pink heart shaped resin ring; and a mini tile pop art style pin-up girl brooch. To enter the giveaway, all you have to do is leave a comment here under this blog post. You can also enter a second time by leaving another comment on the Two Crafty Mules Facebook page. The winner will be selected on Saturday, September 8, 2012. The winner will be announced both here on on the Facebook page. Please make sure I have a way to contact you if you are the selected winner. If I contact the winner and don't receive a response within 24 hours, I will select a different winner. Good luck! I've participated in many internet art swaps over the years, but I have never participated in a Round Robin swap....until now. I'm participating in my first ever art journal swap! (Actually - this makes two firsts for me as I've never made an art journal before.) 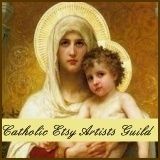 Needless to say, I've been spending many hours on Pinterest looking at art journal ideas. (I love that site!) This also presents a great opportunity to put my Zutter-Bind-It-All to work. I just "had" to have one of these nifty little machines when they first appeared at the local craft store a couple of years ago. I ended up receiving it as a Christmas gift that year and am now using it for the first time. Oh, well, better late than never, right? One of my artist friends on Facebook organized the event; there are 10 people participating. Everyone in our Round Robin group begins by putting their journal together and deciding on individual themes. Each person starts the process by decorating the first part of their journal. The journals are then sent to each person in the group following a mailing list. Everyone will work on each journal sent to them and then send it to the next person until the journal has returned back home to its owner. So...in 11 months, my journal will be returned to me - fully decorated! I'm looking forward to seeing what the other artists contribute to my little book, as well as what themes they have each decided on for their own journals. I'll be sure to share my contributions with you each month during this little artistic journey. It's going to be one awesome little adventure! 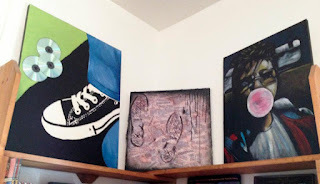 A couple of weeks ago, I received an email from the Arts Center of the Ozarks letting me know that it is time to start working on artwork for their upcoming 5x5 Annual Art Exhibition. My husband and I participated in the event last year and had such a wonderful time, we knew when the opportunity arose again this year, there would be no hesitation. I also began painting yesterday. I will have to let these rest for several days. 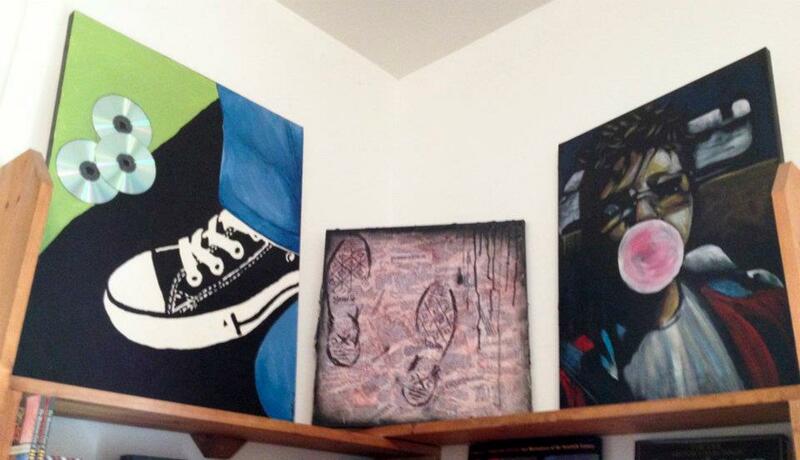 I added molding paste to some of the paint to give texture to the pictures. Once dried, I can add the highlights and finishing touches to my mini portraits. I'll be sure to share the finished items with you upon completion. Until then...have a great weekend! This is my "Words to Live By" mini book necklace. 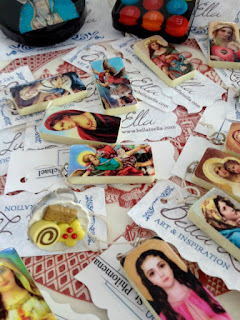 I removed the pages of ephemera contained within the Industrial Chic metal tag pendant and replaced these with handmade pages made with beautiful religious images and quotes from Catholic saints. I added a metal lace filigree finding to the bottom of the book, along with some decorative ribbon-yarn and small cross charms. An image of the Immaculate Heart of Mary was affixed to a domino and attached to the front of the pendant. The necklace is comprised of 2 Industrial Chic charms, along with black pearls and crystals beaded rosary-style to complete the look. Another side view of pendant. One of the book pages; this one features the Virgin Mary with her parents and a quote from Blessed Teresa of Calcutta. This page features St. Elizabeth of Hungary feeding the poor along with a quote from St. Gregory Nazianzen. This page features Jesus and a young girl accompanied by a St. Faustina quote about forgiveness. 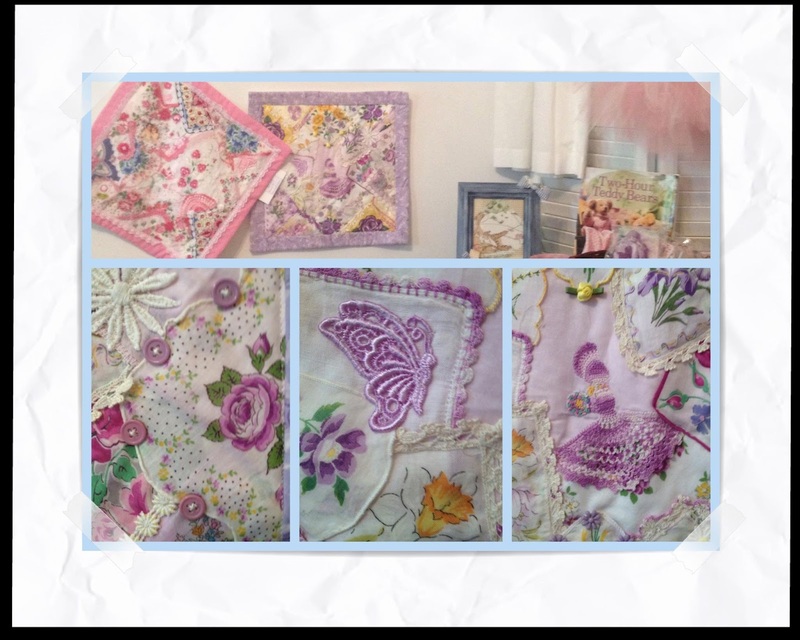 I want to thank the folks at Industrial Chic for inviting me to participate in this blog hop and for my free goodies. I really enjoyed the challenge of creating from the supplies I was given. I can't wait to see what the other participants came up with. 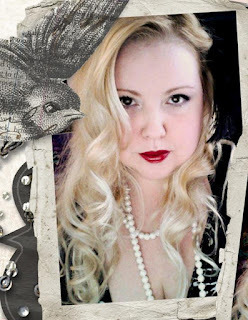 Be sure to check out my previous post for the list of participants and links to their respective blogs. 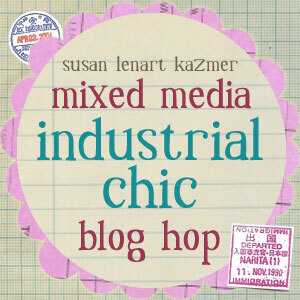 I'm thrilled to tell you I am participating in the in Susan Lenart Kazmer's Industrial Chic Blog Hop event set for July! Stay tuned to see what designs I have created with this little treasure trove of goodies! 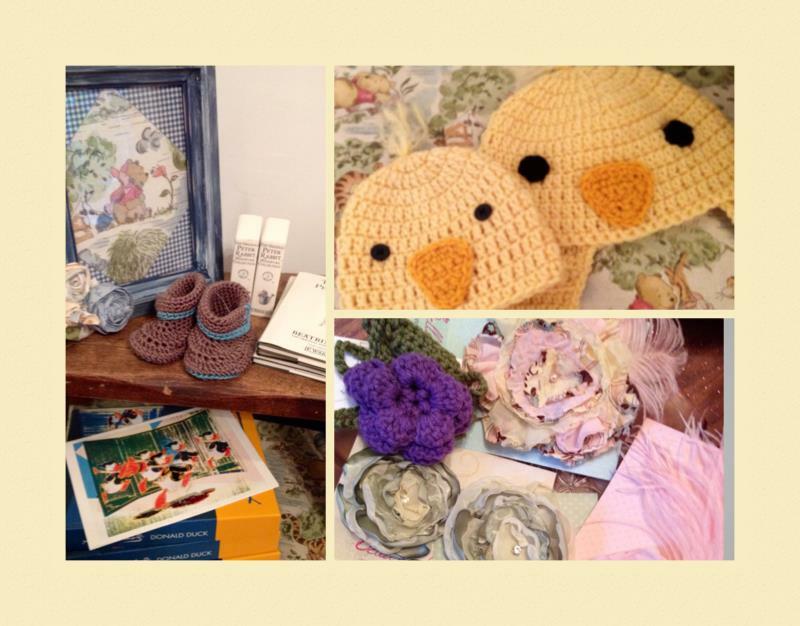 Bella LuElla - New Boutique in Town! 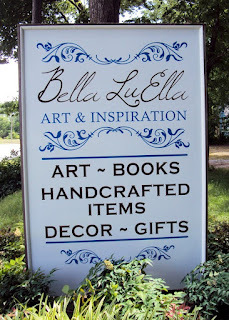 My jewelry designs are carried in several boutiques and gift shops around the United States, and as of 6/1/12, they are being carried right here in my neck of the woods in beautiful Northwest Arkansas at Bella LuElla! 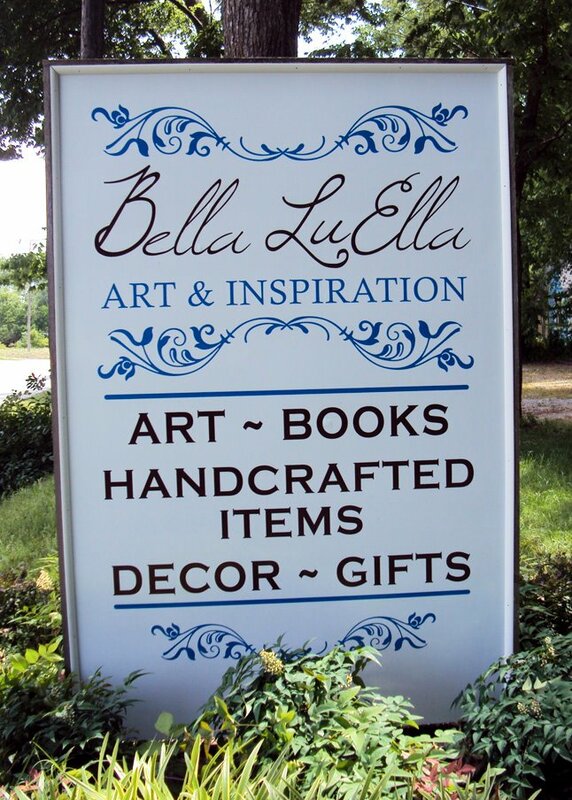 Bella LuElla is an eclectic shop that is located in the same neighborhood as our newest art museum, Crystal Bridges. 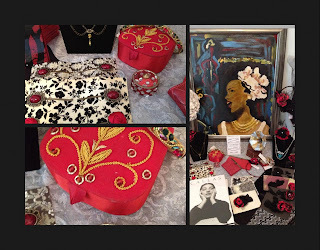 I'm thrilled about this for two reasons: 1) it's the first shop in the area to carry my designs and, 2) this is a brand new shop that carries artwork and designs from local artists in addition to vintage, collectible art and books. Bella LuElla is the brainchild of owner, Cynthia Morshedi. Cynthia was a designer by profession for many years, but she's always had a love of the arts and of creating, in general. After doing some serious soul searching, she decided to set up shop in Northwest Arkansas in order to help promote the arts in our area. And, Bella LuElla was born. 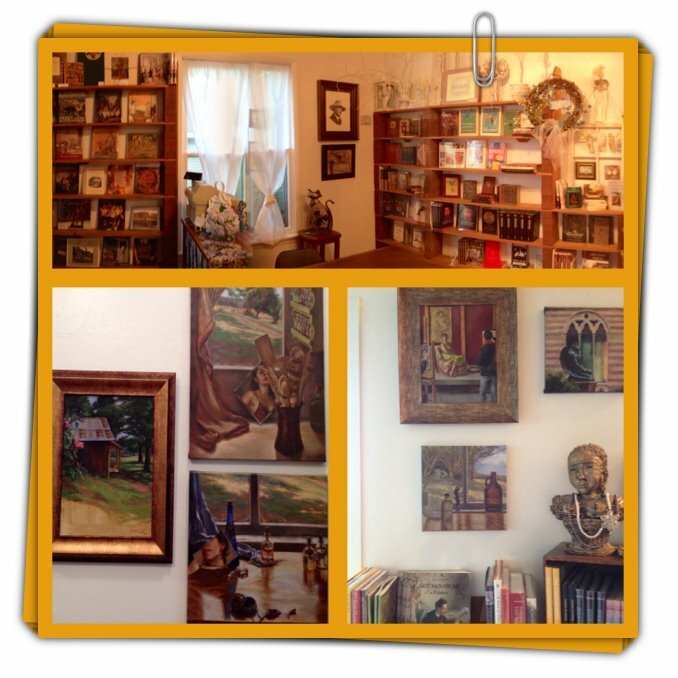 Bella LuElla is a charming shop set up in a vintage 1880's house. It consists of several rooms which are set up by theme. 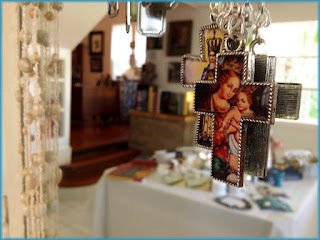 For example, one room houses jewelry, accessories and handmade soap products. Another room houses shabby chic and feminine pretties such as tutu's, fabric hair flowers, and little stuffed animals. (My handmade mini vintage hankie quilts are also displayed in this room.) Cynthia is planning to have a grand opening/reception in the near future. She also is planning to offer classes which will be taught by local artists. 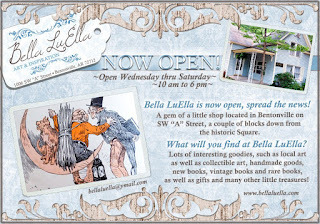 If you are in the area, please take a moment to stop by and visit Bella LuElla. They are located at 1006 SW "A" Street, Bentonville, Arkansas, telephone (479) 644-8483. You can also check out their Facebook Page and blog. In the meantime, take a look at the pictures below for a sampling of what this fantastic little shop has to offer. Hope to see you there! 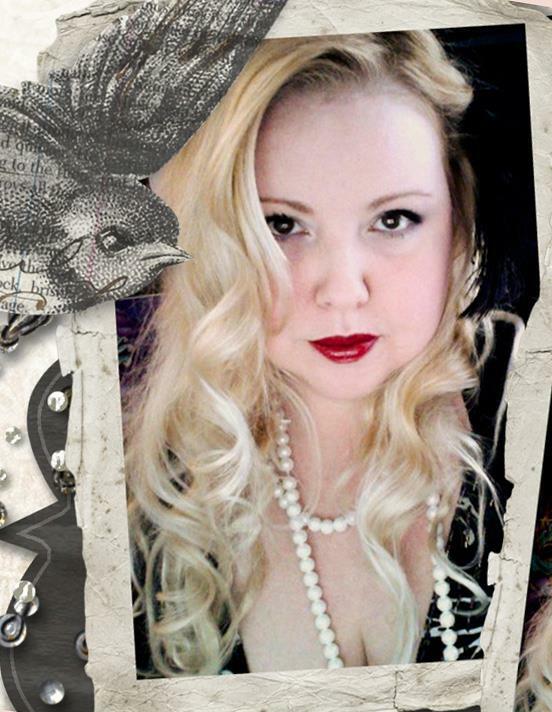 Some of my jewelry creations! Vintage books and collectible, rare art. 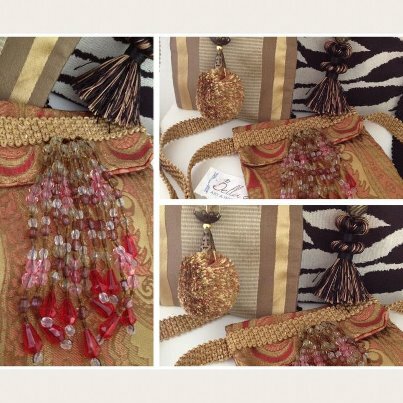 Gorgeous flower accessories made by Cynthia Morshedi. 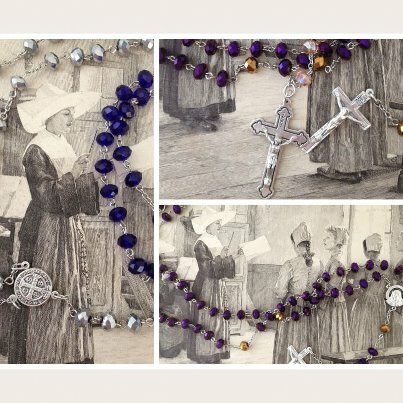 Crystal rosaries made by my daughter, Brianna Rocko. Bejeweled cell phone bags made by Bobbi Gray.